Peerless was founded in 1957 by Bernie Rodger who was already an accomplished builder of "Specials". The Peerless GT entered production in 1958 after two alloy-bodied prototypes had been built and tested the previous year. The Peerless factory had been set-up in Slough and had backing from Jim Burns and John Gordon, who later went on to found Gordon-Keeble. 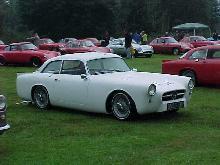 The Peerless GT used Triumph TR3 mechanical items and was later developed into a "Phase 2" version. In 1960 the Peerless re-emerged under new management as the Warwick incorporating some design improvements.